Love Live! School Idol Festival is a free mobile game based on the Love Live! franchise. Developed by KLab for Android and iOS devices, the game combines story, music and card collecting elements into a single package, and is most notable for falling flat in every category. The story side of things is approached in two ways – stories that follow the group as a whole, and stories that follow individual members. For the main story focused on μ’s (that’s read “Myu’s”), it loosely provides a spinoff situation, but more realistically is composed of short and meaningless interactions between characters. The player falls into a first-person position, observing and being referred to as someone helping the groups. The main story has several issues, but only one really needs to be addressed – the pacing. Because of how new parts of the story are unlocked – ranking up a certain amount by playing the rhythm game – there are always very long gaps between chapters. Because of this, it’s easy to forget what happened in the last part without re-viewing it, even if there isn’t much of a coherent story thread between each part. At least the story would feel a bit more justifiable if you could actually view large chunks all in one sitting, or with shorter gaps between them. Where the main story fails to add anything worthwhile, the side-stories are even less effective. After you “idolize” a character and max their bond, you’ll unlock a short side story that is nearly always a one-sided conversation from her to the player. And they always consist of brief non-sequiturs that are short, corny, and absolutely pointless. There’s no deep character interaction, and there’s no actual story to it, it’s just a very quick “Hey look at me and my generic personality! Oh yeah, thanks for being awesome, you playing the game! If it weren’t for you I wouldn’t be able to get this far. [insert vague comment about offering a reward later].” If it wasn’t for the one love gem you get out of these, I doubt anyone would waste their time. As for the collection side of the game, you gain new idols in a few different ways. Every day you get one free one simply for logging into the game, but these are generally common ones – your chances of actually getting a Myu’s member are very low. 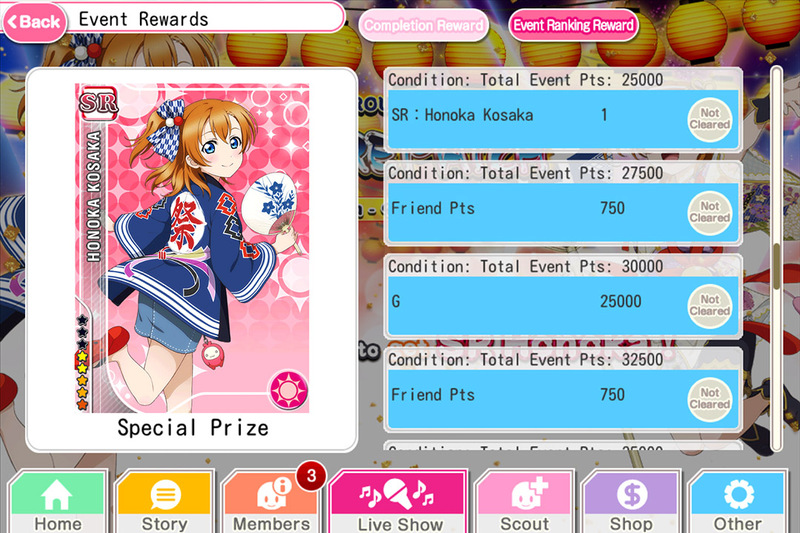 You also accumulate friend points as rewards for certain song goals, which can then be used for “scouting” common or rare idols. 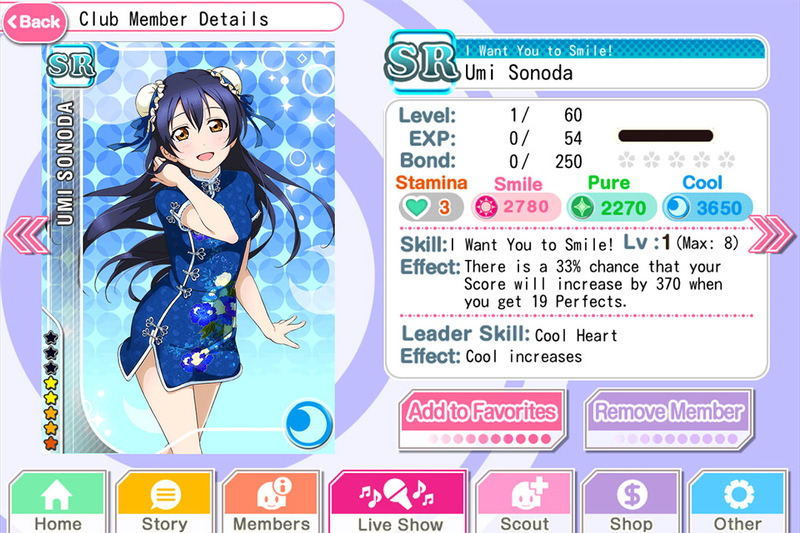 And then there are love gems. Like friend points, love gems can be accumulated just by playing songs on the higher difficulties (and scoring well), or through things such as events. To scout with love gems, which will guarantee at least a rare idol, five love gems are required. By itself, this is okay and paced decently for how often you’ll receive them. 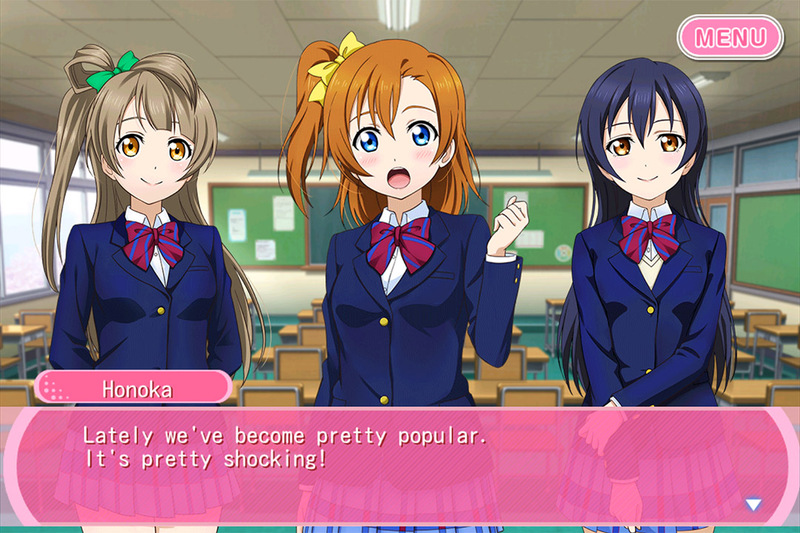 There are two issues though – idolization, and what else love gems are used for. To “idolize” someone, you need two of the exact same idol. For example, you might have a “cool” (blue) super-rare Maki with one character portrait and effect, and another cool super-rare Maki with a different character portrait and effect, but you cannot combine them to idolize – the idol needs to be identical. 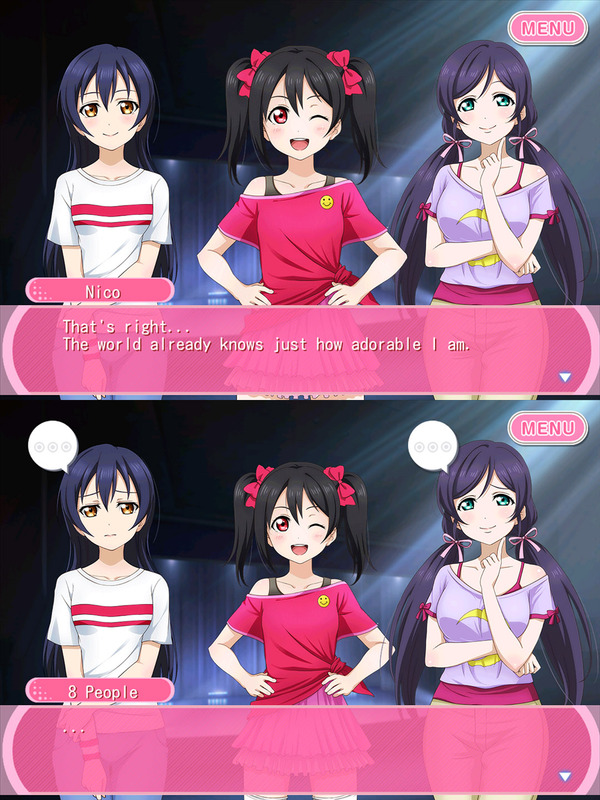 Because of the percentage to get a super-rare versus a rare – not to mention the likelihood of getting one specific idol from a random chance draw from the pool of super-rare ones – it is extremely unlikely that you will ever be able to idolize a super or ultra-rare idol without relying on microtransactions for more love gems. And without fully idolizing, you won’t be able to score as well on songs and get better rewards. 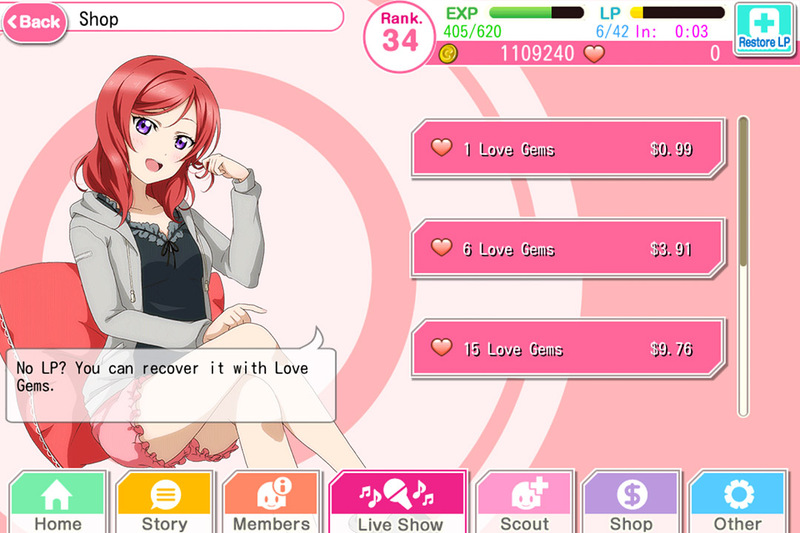 And that’s not all love gems are used for. Whenever you play the rhythm game, you consume LP, the amount depending on the difficulty level. Easy songs cost 5 LP, Medium cost 10, Hard cost 15, and Expert cost 25 (there are some exceptions, but that’s the general rule of thumb). Now imagine that you only have 45 LP, and each song is two minutes long. If you play 3 songs on Hard, you will consume all of your LP in about 6 minutes. There are two ways to get it back – wait 4.5 hours for it to repopulate naturally (you gain one LP every 6 minutes), or use a love gem to immediately replenish it. The gameplay balance is so out-of-whack that even when you’re playing abridged versions of the songs, you are drastically limited in how much you can play in one session. Realistically, you can only get about three songs in unless you’re willing to pony up your love gems or waste actual money to immediately get more time. Playing Expert level songs never feels like it’s worth it because they cost so much LP but hardly provide justifiable rewards. Honestly, this problem could be solved extremely easily – a practice mode, with no rewards but unlimited attempts to try your hand at something. Or, there could be a trade system so people can dump off excess weight and get the idols they really want. But alas, it’s all or nothing. And then, there’s the song selection. At rank 50, which I think is relatively far in, it’s only 15. 15 songs. That’s it. Outside of the cycling “B-sides” (two at a time) and whatever event songs may be available, that’s it. In that regard alone, this completely fails as a rhythm game. But instead of just talking about why the game is a failure, here’s a demonstration of one song on the three main difficulties, plus it will show the differences in pop-ups. And then I’ll get into the problems there. One of the first things you may notice – and my biggest problem – is that the actual player input is based on a fairly arbitrary rhythm. Instead of following the vocals or instrumentation, they just made up some new rhythm to go along with the song, and it can differ drastically from one difficulty level to the next. For many songs, the rhythm will actually clash with the song as a whole, having unnecessary syncopation or not following anything happening with the music besides the base tempo. Playing a rhythm game without input that feels directly connected to the music you are hearing is not only a flaw, but cuts out nearly any motivation to play. The songs I found myself playing the most were the ones that actually had a rhythm that followed the music, making it easier to get into the groove and roll along without forcing myself – even if they weren’t the best songs as a whole, they were the most fun to play. And in that video you can also hear the annoying sound effect used for player inputs, at 50% of its normal volume. On the higher difficulties, it’s commonly difficult to tell which note comes first in a quick sequence. There’s no clear reference of timing like you would see with something like Project DIVA’s timer for each note, or Guitar Hero/Rock Band’s clear distinction of rhythm by marking out measures and subdivisions, complete with a consistent perspective for all notes. When notes are moving fast and in different directions, it is extremely easy to miss what’s first of the bunch, or what order a quick section should be handled in. In the video, you can also see the pop-ups for the Myu’s members when their effects activate – each idol has a skill that will restore stamina, allowing you to get away with more mistakes; boost your score by some fixed amount after a certain amount of notes; or they increase the input window to give more leeway. Fortunately, the pop-ups can be reduced or entirely turned off, as the large ones are very distracting and make it difficult to track notes in faster songs. What skills are most helpful depends entirely on how easy a song is for the player. And the non-Myu’s idols, of which there are many, basically only exist to fill your ranks early on, and then to be idolized for love gems. They don’t have skills, they have low stats, and leveling them is a complete waste of time. If there’s one good thing I can say about this game (besides the pretty young anime girls), it’s that the events are good. They offer more songs than are normally available – independent of your rank or anything like that – and clearly show what scores are necessary for what rewards. It’s unlikely that you’ll perform well unless you either schedule your play time for the duration of the event or spend love gems to play as much as possible, but at least they provide a solid reason to try to perform well and consistently jump back in. As far as rhythm games go, I’d say this is easily the worst I’ve played, sitting below even the disappointment of Guitar Hero: Rocks the 80s. The song selection is inferior to nearly any other rhythm game, you’re limited in how much you can actually play, the idol collection basically requires you buy love gems for idolization, and the rhythm game element itself is flawed from the basic design. In a game riddled with so many issues, it’s impossible to point out one single “worst” thing about it. Just kidding, Nico’s the worst part. Play time – As a mobile game, it doesn’t have a definitive ending. However, you’re extremely limited in how many songs you can play at a time because of the LP consumption. I have no idea how much time I might have spent on it altogether. Recommendation – Don’t waste your time, and certainly not your money. Next Post Poll: What would you like to see a post on? This game didn’t keep my attention for long. The only plus was that it had more interactivity than other mobile card collectors thanks to the rhythm mini-game. This and Fallout Shelter are the only mobile games I’ve really tried. I doubt I’ll bother with more in the future. I know a lot of people are still playing it, but it just doesn’t feel remotely worth it for me. It’s actually been over a month since I’ve played it. Even when I was playing, I was never aiming for anything in particular. I was just hoping for no Nico.